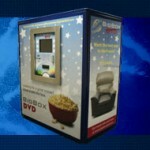 BigBox DVD rental kiosks offer something different than other movie rental services, renting by the hour. According to the company, you can rent a new DVD release for as little as 6 cents per hour, older than one year DVDs for 4 cents per hour, and Blu-ray Discs for 9 cents per hour. A little math…24x.09=$2.16. Not bad. Renting a hi-def disc for 24 hours will cost you $2.16. Mosquito Productions of Blaine, Minnesota announced they opened their latest BigBox DVD rental kiosk in the Twin Cities area, giving residents of Minneapolis and Saint Paul another choice in movie rentals. The company says its kiosk design can hold up to 15 times the amount of discs than competing services. Their website, BigBoxDVD.com, allows you to search through 100,000 titles and make suggestions for stocking the kiosks.